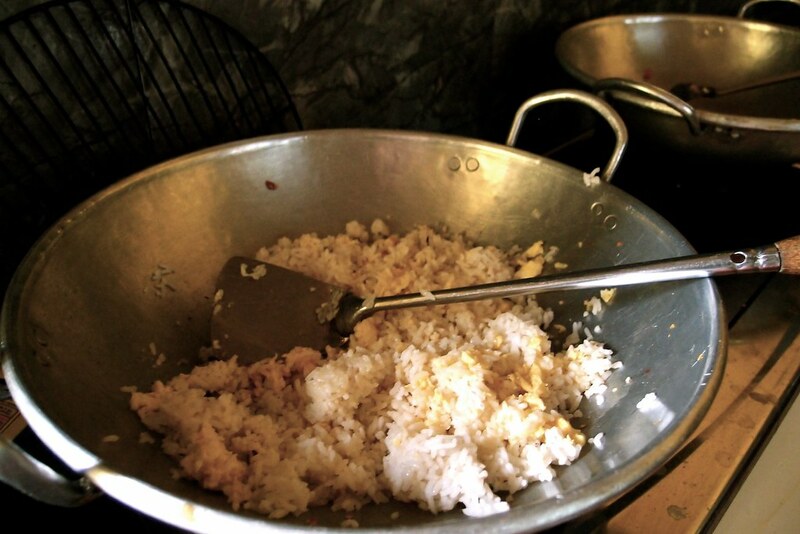 Nasi is the staple of the Indonesian diet. Plain white rice is eaten at every meal—breakfast, lunch and dinner. 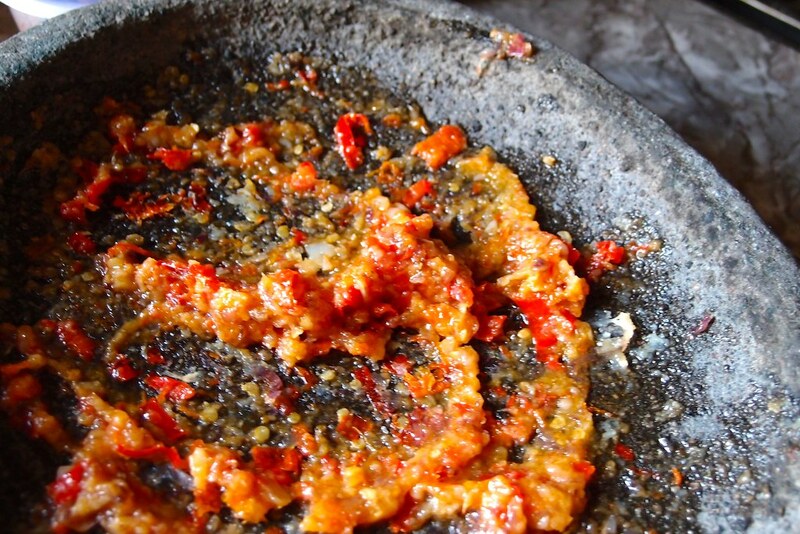 If you didn’t eat rice, Indonesians believe that you didn’t really eat. 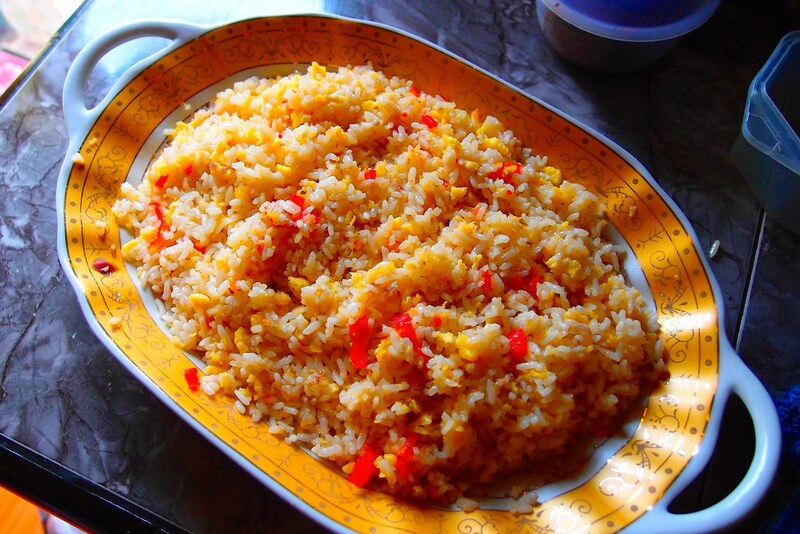 Beras, or uncooked rice, is the basis of many other dishes too. Lontong, is rice cooked in a special way, so that it makes a compact gooey rice cake—for lack of a better word—that are eaten primarily during special occasions instead of the usual white rice. It’s actually quite tasty, though also plain. The accompanying vegetable and meat dishes are usually so flavorful that the plainness of the rice or lontong is very complementary. 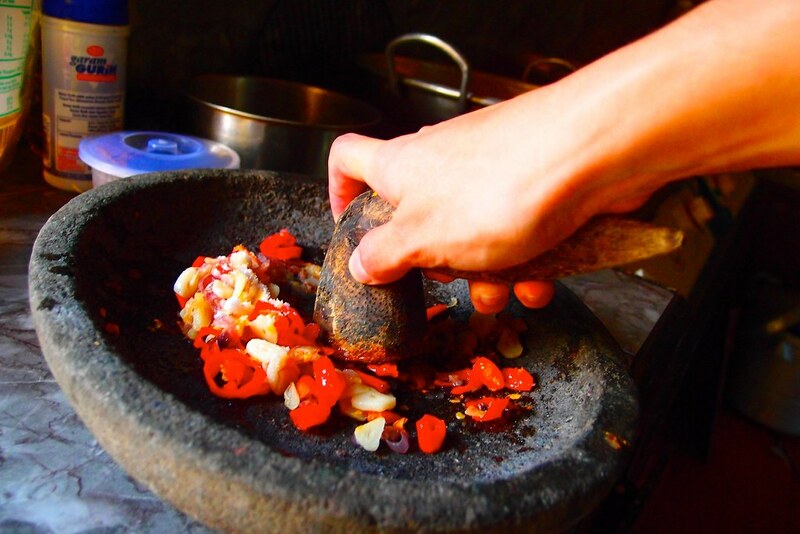 It also helps balance out dishes that are really pedas, or spicy. 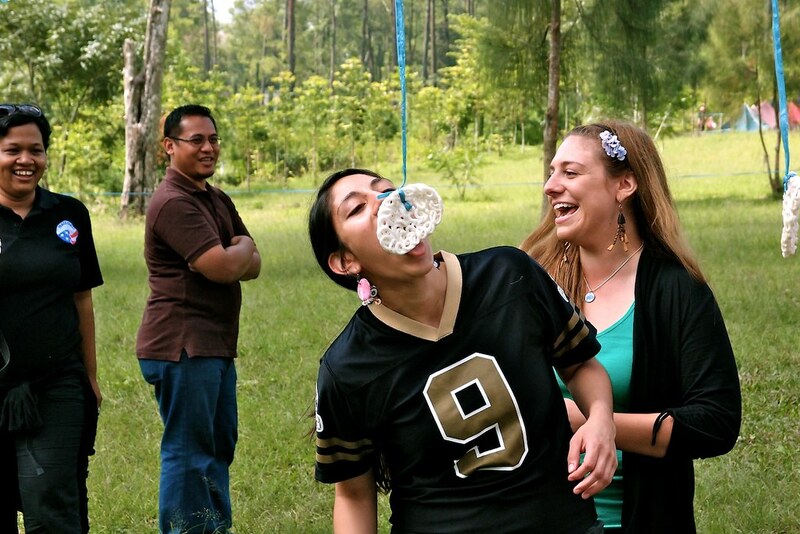 There are many other sweet dessert dishes derived from rice and some varieties of krupuk, which are Indonesian’s version of tasteless, crispy rice cake. After four months I’ve learned to like krupuks, but it’s definitely an acquired taste, with zero nutritional value. I hardly ever cook anything, so cooking even this simple dish is a huge deal and I got to make my momma proud by showing evidence of my first time cooking nasi goreng all by myself. 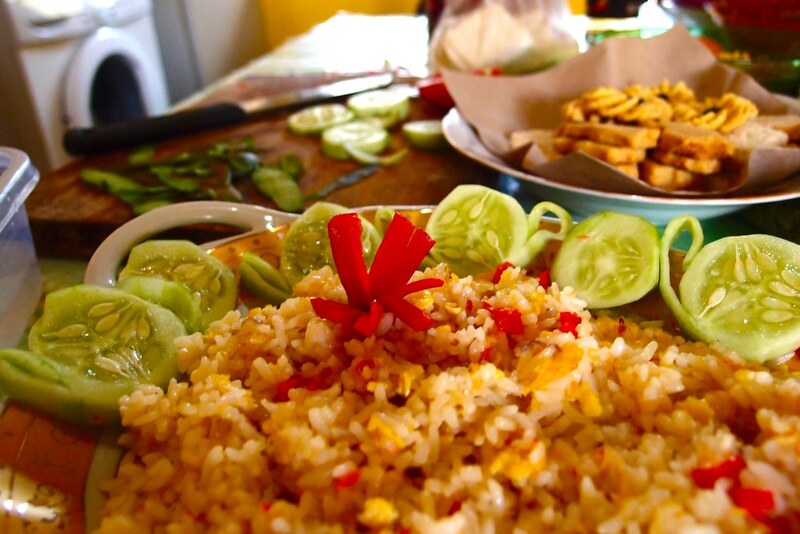 There are a million ways to cook Indonesian fried rice, but here’s how they do it at my house. Calories: We don’t believe in counting those in Indonesia, and we’re fans of the empty calories (i.e. krupuks). My ibu really got into this project and insisted that we photograph the ingredients arranged in this green, leaf-shaped plate. 1) Cut the red shallots, garlic, and red chili peppers. My ibu laughed incessantly when I wept over the shallots as I cut them. I’m not used to it, ok? 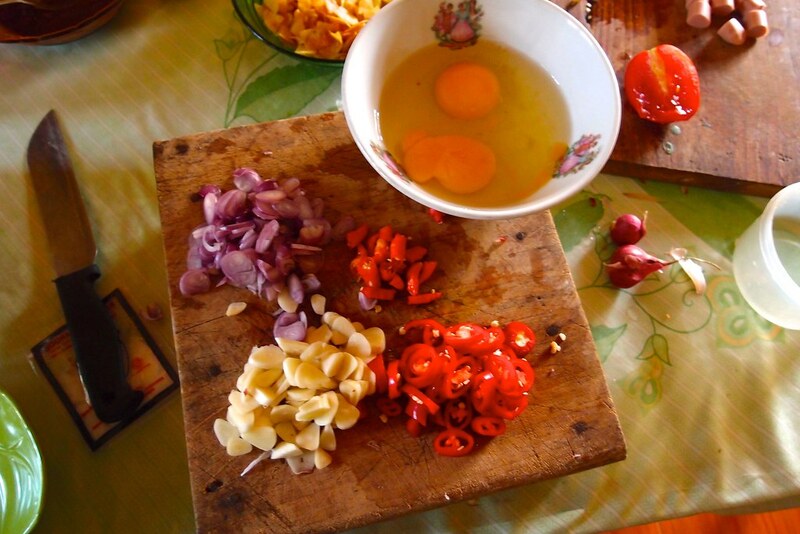 2) Fry all this together using a wok-like pan and about ¼ cup of vegetable oil. 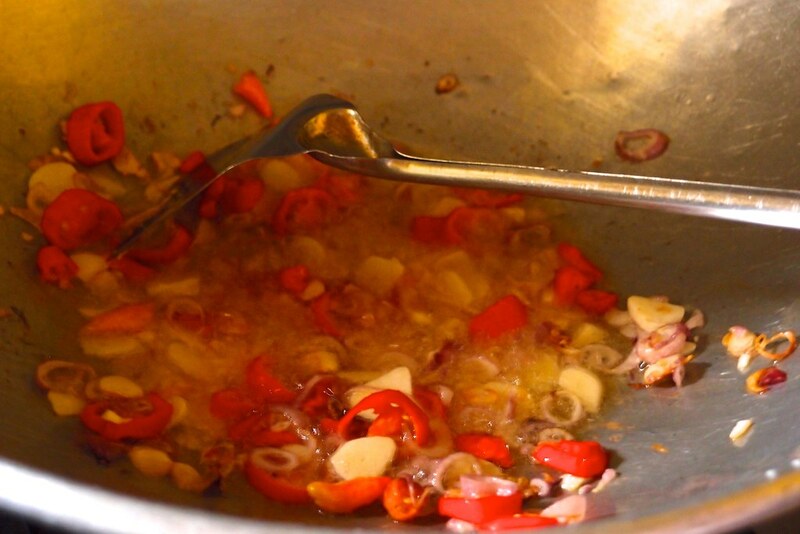 3) Once the mixture is sufficiently soft and cooked, remove it from the oil. Use a stone grinder to mash the ingredients;. Add about 1 teaspoon of salt. and this is the result once my ibu lent a helping hand. She insists that I will learn eventually. Perhaps that is true, but it may not be worth the pain to my hand. 4) Crack two eggs and scramble in the same wok with same, leftover oil. 5) Once the eggs are scrambled, stir in about 5 cups of cooked, white rice. The scrambled eggs are beneath the pile of rice, that later get mixed together. 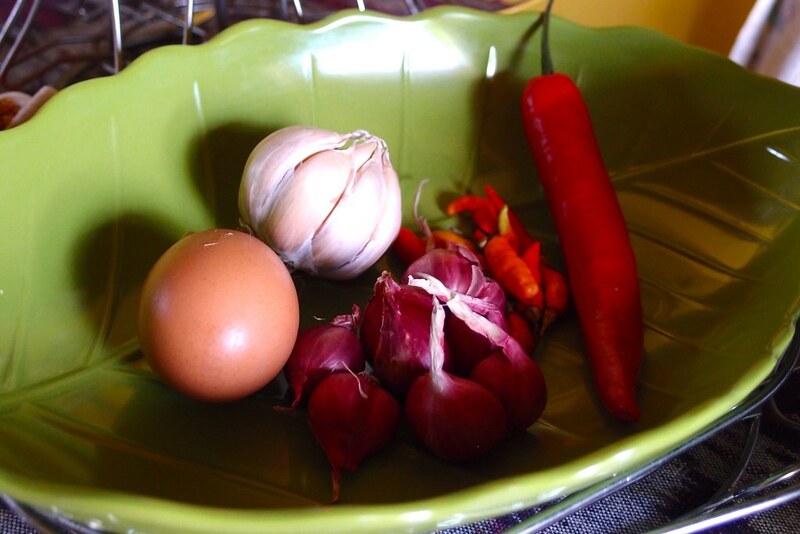 6) Stir in the ground mixture of garlic, peppers and shallots. (Insert drum roll) Tad-ah, Nasi Goreng! My ibu was so into this that she insisted on making cucumber flower garnish for a photo. Hers were lovely, and mine…a total fail. The good thing about mistakes is you get to eat them…but needless to say, I ate most of the cucumber. (Hence, clever angle of this plate.) Baby steps, Ibu, baby steps. Tags: dinner, food, fried egg, fried rice, Indonesia, Indonesian food, nasi goreng, recipe, rice, vegetarian. Bookmark the permalink. Actually, as far as I know, it’s important to make fried rice with left over rice. I think it’s because left over rice has kinda lost its water content and it makes it more grainy (for lack of a better description) when it’s done. If you use freshly made rice, then the water content is still high, and it becomes not so nice as the rice may clump together and be not as grainy. But, I am speaking on the context of Indonesian rice. I’m not sure if you use rice like basmati rice, maybe you can just straight away make fried rice out of freshly made rice. Either way, I think some dishes require specific type of rice. I think the common Indonesian rice will not be suitable for risotto or paella for example. I was looking for a good fried rice recipe two days ago. I’m so glad I found your blog. It’s amazing what you have created here. Your talents are very inspiring. I will bookmark this for sure. Wonderful and delish! I’m not sure I understand your question…I learned this recipe from my Indonesian host mother, no google translate necessary.